Health-care professionals in all different roles responded to the crisis in Boston, caring for patients, organizing triage, and making sure their institutions were equipped to handle an unknown number of serious and life-threatening injuries. Information plays a critical role in disaster situations -- starting months or years in advance with the development of city-wide clinical disaster protocols, right up to the time of crisis with rapid access to best practices for trauma, blood transfusion, explosion injury management and more. Elsevier's chief medical informatics officer, Dr. Jonathan Teich, is an emergency physician who has been directly involved in disaster situations several times, from mass shootings to bus crashes. In the wake of the 9/11 attacks and the anthrax attacks that followed, he published a paper titled "The Informatics Response in Disaster, Terrorism and War" in an Elsevier journal. He was not on duty during the initial response to this week's Boston Marathon bombing, although he was involved in a highly personal way: his son and brother-in-law ran in the marathon. He said his immediate priority was as a father, not a doctor -- finding out if they were okay and where they were, which took nearly two hours because of clogged cell phone communications. His son was unhurt, but the brother-in-law ran right past the second explosion as it occurred and is dealing with some hearing loss. 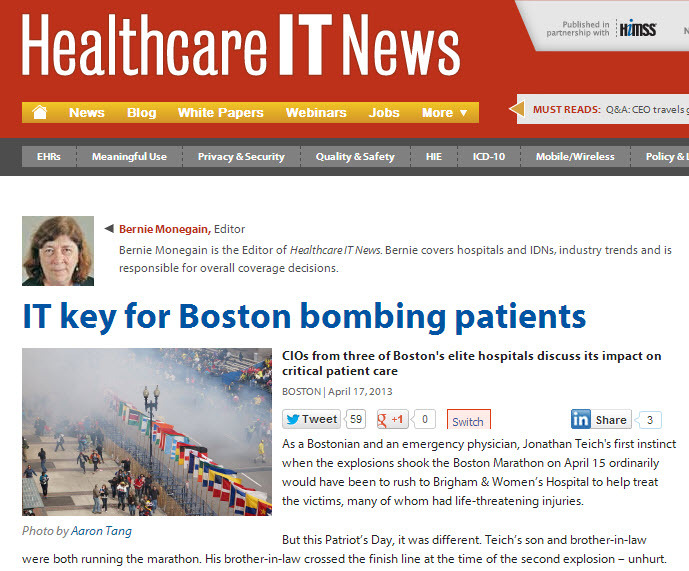 Dr. Teich was one of six medical professionals featured in Healthcare IT News — a top health-care technology trade magazine — in an article about the Marathon bombing. Editor Bernie Monegain interviewed each of them about medical informatics and health-care IT are used in response to disasters. There are several aspects to information management in a disaster. As you can imagine, this is a situation full of many more patients with much higher acuity than we're used to, often with types of problems, such as blast injuries, that we train for but do not see very often. He pointed out that at at a number of Boston hospitals there are physicians who have honed these skills by responding to disasters around the world. He said they have developed documentation, record-keeping and management systems, care protocols and order sets that are helpful in disaster response. John Halamka, MD, Chief Informatics Officer of Beth Israel Deaconess Medical Center in Boston, a practicing emergency physician and Harvard professor. Scott Ogawa, Chief Technology Officer and Deputy CIO at Boston Children’s Hospital. Jim Noga, Vice President and CIO of Partners HealthCare, founded by Brigham & Women’s Hospital and Massachusetts General Hospital. 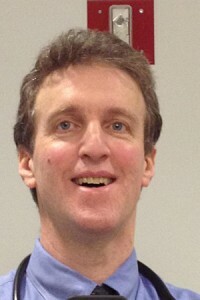 Joseph Kvedar, MD, founder and Director of Center for Connected Health, part of Partners HealthCare. Chuck Parker, Executive Director of Continua Health Alliance.